The girl in this pastel wears school clothes: a brown skirt with a red apron, dark stockings and clogs. She obviously poses for the painter with her little brother. Their seriousness and composure comes from being the subject of a painting and the fact that they are also on their way to school. The children live in a protected environment: in the background we see a house and women in local costumes chatting. A newspaper photograph of 1899, which shows Liebermann´s studio in Berlin, includes a smaller version, now lost, of this painting. After a course of study in Weimar, Lieberman first went to Paris. He was interested in the Barbizon school of painting, especially in François Millet. However, after the Franco-Prussian war, Millet refused to have any dealings with Germans and Liebermann never really felt that he was welcome there. In Holland, however, Lieberman felt immediately at home: the wide landscape under a high sky generally dotted with bright clouds, the friendly people, and the orderly communities touched a profound chord with the painter. With a study visit in 1876, he began his almost yearly journeys to Holland until the outbreak of World War I. 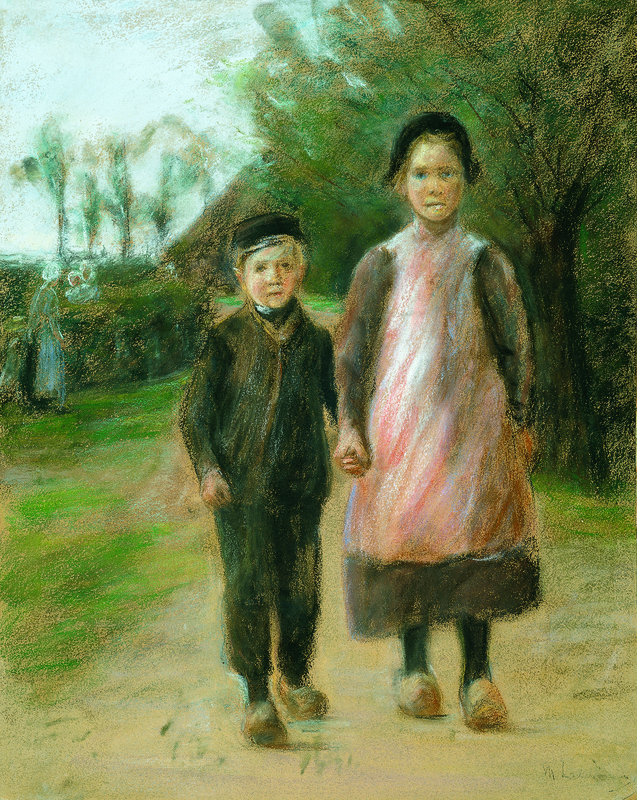 In 1884 the Dutch-Jewish painter Jozef Israëls, a friend of the Liebermanns, introduced the couple to the small artists´ village of Laren on their honeymoon. In 1886 the painter Jan Veth drew his attention to flax spinning there, prompting the creation of one of Liebermann´s great paintings, Flax Barn in Laren (National Gallery Berlin). Liebermann's conversion from dark studio painting to lighter, sketchier plein air painting took place in Holland. Liebermann did not turn to pastel until the end of the 1880s. He used it for rapid, coloured nature studies or to test the structure and effect of the paintings he had in mind. Between 1890 and 1898 he produced numerous pastels. The Flax Barn in Laren received the First Gold Medal in Munich in 1887, but it was not until 1897, on his fiftieth birthday, that he was honoured with a sumptuous extraordinary exhibition.